Organisation: The practice startes with the player in the centre circle. He dribbles the ball 10 yards and then plays a quick 1-2 into Player A. He then plays the ball into the corner area for player A to run onto. Player A crosses the ball in first time and the two strikers time their run and attempt to score. Variation: (left side) Player 1 dribbles and makes forward pass in front of winger(player 2) running inside. 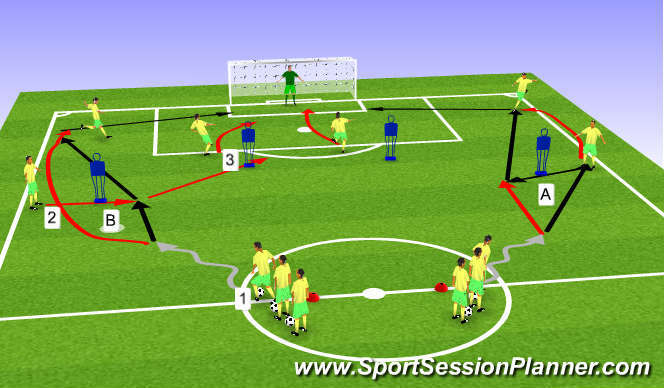 Player 1 immediately overlaps and receives a through ball to the corner and sends in a cross.